A report published by the European Environmental Agency (EEA), ‘Late Lessons from Early Warnings, volume II’, provides historical case studies, which show that warnings about asbestos were ignored or sidelined until damage to health and the environment was inevitable. The ensuing human, social and economic costs were extremely high. “In some instances, companies put short-term profits ahead of public safety, either hiding or ignoring the evidence of risk. In others, scientists downplayed risks, sometimes under pressure from vested interests,” notes the report. The report provides examples of how early warning scientists were harassed for bringing inconvenient truths about impending harm to the attention of the public and regulators. There is also some evidence, says the report, that young scientists are being discouraged from entering controversial fields for fear of similar harassment. The report recommends wider use of the ‘precautionary principle’ to reduce hazards in cases of new and largely untested technologies and chemicals. It states that lack of scientific certainty is not a justification for inaction when there is plausible evidence of potentially serious harm. This report is particularly timely for Canada, where the Harper government has both gagged federal scientists to prevent them from speaking “inconvenient truths” and, on the other hand, has also decimated the number of agencies and government experts whose responsibility it is to monitor environmental and health risks. The government has also thrown wide open its doors to corporate lobby groups, particularly the oil industry, while initiating threatening and punitive measures to silence the voices of civil society groups who defend health and environment. It is more than somewhat ironic that the governing political party in Canada is called the Conservative Party, when it has, in fact, launched a ruthless war on conservation and on the precautionary principle. The first EEA volume, Late lessons from early warnings: the precautionary principle 1896-2000, was published in 2002 and included a chapter titled Asbestos: from ‘magic’ to malevolent mineral, by David Gee and Morris Greenberg. The chapter began with the following sobering quote: ‘Looking back in the light of present knowledge, it is impossible not to feel that opportunities for discovery and prevention of asbestos disease were badly missed.’ Thomas Legge, ex-Chief Medical Inspector of Factories, in Industrial Maladies, 1934 (yes, 1934!). If the asbestos industry had not succeeded in suppressing and distorting the scientific evidence for so many years, many hundreds of thousands of lives could have been saved. 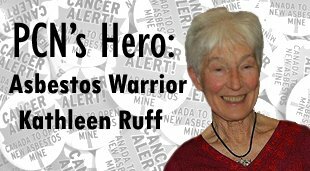 It is abhorrent that today, in 2013, the asbestos industry and scientists funded by it continue to deny the evidence of harm caused by asbestos and to promote its continued use. In April/May this year, the UN Rotterdam Convention 6th Conference of the Parties (COP6) will take place in Geneva and, once again, the Convention’s expert scientific committee (the Chemical Review Committee) will present its recommendation to put chrysotile asbestos on the Convention’s list of hazardous substances. Listing would require “prior informed consent” and a number of safety measures before chrysotile asbestos can be exported to another country. The Convention provides minimal safety standards and the basic human right of prior informed consent. Yet even that is too much for the asbestos industry; for more than a decade it has fought to sabotage the Convention and block the listing of chrysotile asbestos. For the past ten years, Canada has acted as the leading saboteur for the global asbestos industry. Following the defeat of efforts to re-open Quebec’s last two asbestos mines, however, the Canadian government has finally announced that it will no longer block the listing of chrysotile asbestos. Russia, however, continues to produce 1 million of the world’s annual 2 million metric tons of asbestos. At the same time, it is using less and less of the asbestos it produces. In 2000, Russia used almost half of its production domestically, representing 22% of world asbestos consumption. In 2011, Russia used only one quarter of the 1 million tons of asbestos it produced and exported the other three quarters. Export of asbestos is thus increasingly important to the Russian asbestos industry. Russia has now ratified the Rotterdam Convention and at the 2013 conference, will for the first time be a full party to the Convention. In the months leading up to COP6, the asbestos industry is financing efforts to, once again, try to pervert the science, deny the harm and ensure continued trade in asbestos without the hindrance of even the minimal safety restrictions contained in the Rotterdam Convention. In November 2012, the Russian Research Institute of Occupational Health (a notorious ally of the Russian asbestos industry), together with the Institute for Occupational Health of Ukraine, held a conference in Kiev, Ukraine, at which discredited speakers, long allied with the asbestos industry, made presentations promoting the industry’s propaganda that chrysotile asbestos can be “safely used”. The conference, as planned, passed a resolution calling for chrysotile asbestos NOT to be listed as a hazardous substance at the upcoming Rotterdam Convention conference, claiming that the evidence is still not clear as to whether chrysotile asbestos is harmful. While the lead author of the paper, David Bernstein, presents himself as an independent scientist, he has been forced to admit, under persistent questioning by a judge, that all his asbestos research has been financed by the asbestos industry. Prior to that, his tobacco research was financed for eighteen years by the tobacco industry. Bernstein was, of course, a speaker at the Kiev conference. Bernstein’s 2013 paper, Chrysotile Revisited, makes use of research financed by the Quebec asbestos industry that was carried out by the chair of McGill’s Dept. of Epidemiology, Prof. JC McDonald. Like Bernstein, McDonald claims that chrysotile asbestos is “virtually innocuous”. Also like Bernstein, McDonald has for the past decades used his industry-funded research to promote use of chrysotile asbestos. McDonald collaborated with Bernstein in efforts to try to persuade the World Health Organization and the government of Brazil to approve the use of chrysotile asbestos. The asbestos industry is a flagrant example of what the EEA report describes – putting profits ahead of human lives and hiding the evidence of harm being caused.